The Pocket DVD Wizard lets you use your computer to convert your DVD and video files into files your handheld device can play, without additional expensive software or hardware. The Pocket DVD Wizard is very easy to use. It works on any PC that can play DVDs using Windows Media Player. You can fit hours of DVD video on a single memory card. 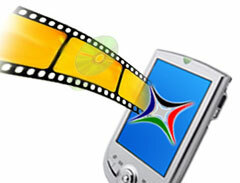 Store 100s of movies on devices with hard drives such as the Archos, iPod Video, or FlashTrax. The Pocket DVD Wizard supports multiple output devices, it doesn't matter if you have just one device or a few, you only need one piece of software. 'Black bars' on the top and bottom of the picture can be removed from standard widescreen recordings. You can record multiple episodes to separate files without additional user interaction. You can enhance the video brightness for small device screens and extend valuable battery life. You can select high quality, balanced output or high speed - you make the choice. You can select alternate languages and subtitles. You have all the power you need, but using the Wizard interface it's as easy as 1-2-3.